Is the bite of this spider at all dangerous? 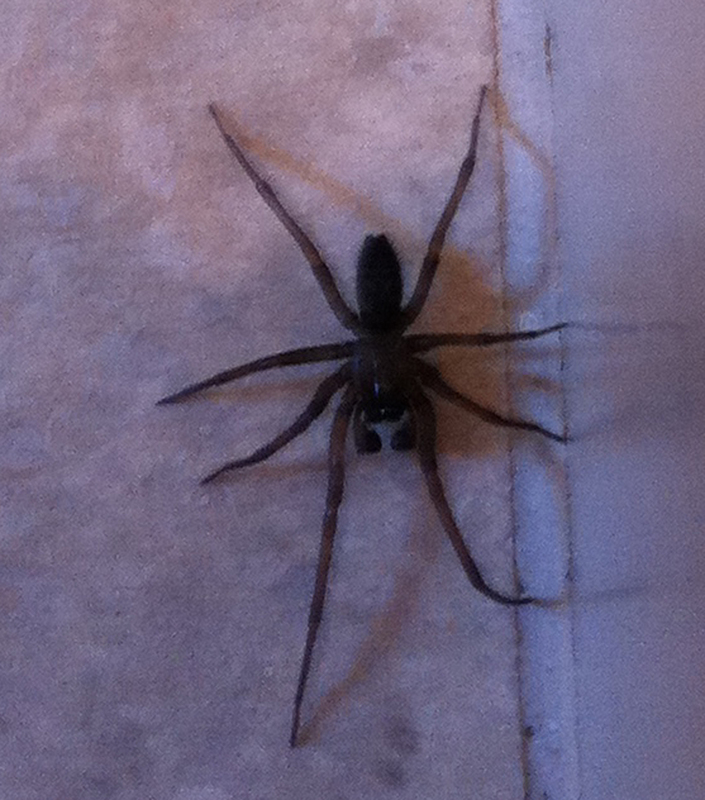 Let me know if you can identify what kind of spider it is. Martha Serna, Serna Insurance Agency, Humble, TX. The spider’s bite Martha wrote to me about was rather painful, so Pete wasn’t amused by its “playful” response to the close encounter it had with his body. Naturally he was concerned, too, about the possibility that the bite might be more than just an annoyance. 1. leg I is longer than the others, with legs II and III shortest and subequal, and leg IV not as long as leg I. 2. The palps are clearly those of a male, being enlarged distally. 3. Spinnerets are visible in the dorsal view, and trail beyond the posterior abdomen, but not extraordinarily so. After processing the image to bring out additional details, it was possible to note a glabrous (shiny, rather than hairy) carapace, which is longer than it is wide, and a darkened longitudinal stripe on the abdomen marking the position of the spider’s heart. These features are common to a number of spiders, among them several in the family Miturgidae, particularly the yellow sac spiders Cheiracanthium inclusum and C. mildei. Yet, it doesn’t have some of the other markers of the yellow sac spider, such as a pale abdomen, a bright yellowish or greenish carapace with darkened eyes that stand out against a light background; a similarly pale abdomen, and darkened tarsi with pale femurs and tibias. A quick answer to Martha’s first question was still possible, though, even with all that we didn’t know still on the table. 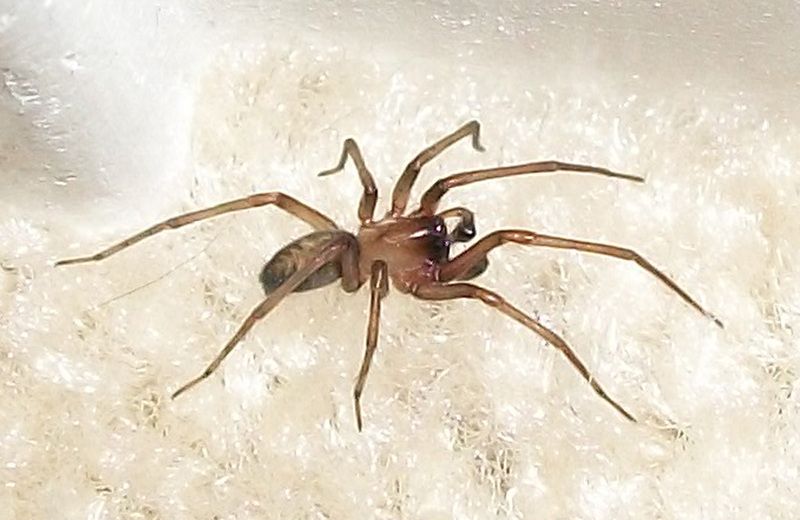 That answer was “No, it’s bite — though possibly as painful as a bee sting, and that may raise an angry red welt that can remain tender for a few days — isn’t likely to be of any medical significance.” Such an answer is possible simply because this isn’t a black widow, and it isn’t a brown recluse. In Texas, ruling those two spiders out is enough — most of the time — to enable the party bitten by a spider to just sit back, relax, and wait for the pain to subside. Martha (and her husband, Pete) wanted to know its precise identity. 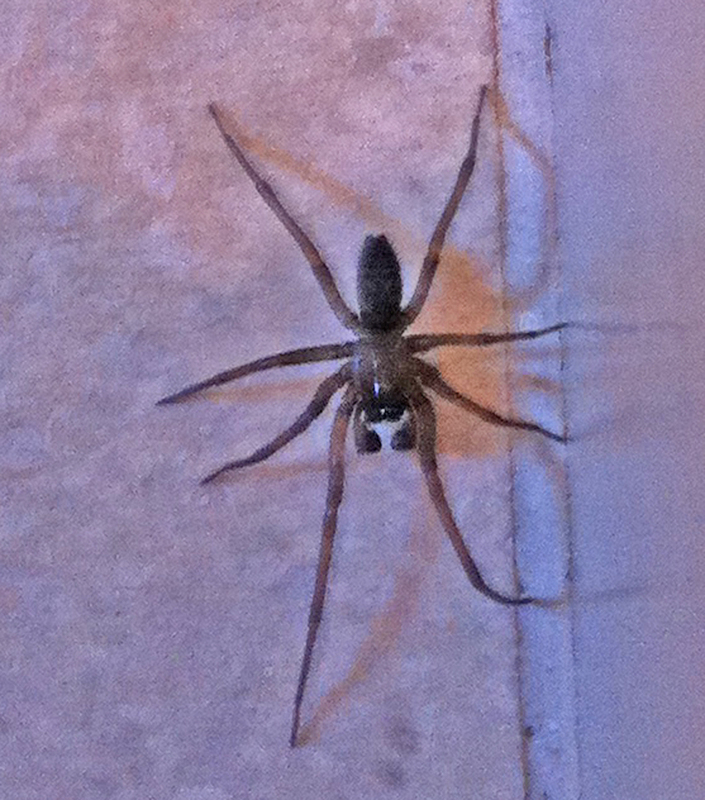 And my friend, Truxter, who works in Houston and has a new home there that is overrun with a bunch of spiders, many of which are very similar to this one, wants to know what kinds of spiders he’s seeing on the walls and floors of his home, too. Not that he’s been bitten yet, but he’s seeing a lot of these spiders, and — as he puts it — it’s freaking him out. One of these days he, like Pete, may get a little too close to one of these arachnids and fall victim to its minuscule wrath. It must be pointed out, at this stage in the discussion, that the photos supplied by Martha and Truxter are not of sufficient quality to permit an absolutely positive identification of the spiders they depict. That is not a criticism of the photography, but a statement regarding the great lengths one often must go, just to identify a spider to genus and species. While some of our North American spiders are so strikingly adorned, colored, or otherwise marked as to be immediately identifiable, even in a relatively fuzzy image, these — at first glance — are not. They are simply too ho-hum in appearance to suggest to the unitiated, that is, to anyone who has not identified this spider before (like me, for example, until recently), to even think it can be identified on sight. One is lulled into believing that a multitude of small, brown, essentially unremarkable spiders like these, from what one would guess to be a number of genera and species, must surely abound in nature. Eye pattern and a host of subtle anatomical distinctions must be examined very carefully in order to distinguish between most spiders of such ilk, and that degree of minutiae are beyond the capabilities of even the best photos to display, particularly when they depict only one perspective. Yet, with respect to this spider at least, it happens that it bears several unusual characters that adorn but one particular spider, namely Metaltella simoni, a species in the Amphinectidae family that was first described by Forster & Wilton in 1973. The genus Metaltella was first described by Mello-Leitão, in 1931, and the species simoni was first described by the German arachnologist Eugen von Keyserling in 1878. It is native to temperate South America, but in the 1940’s was introduced into ports along the Gulf Coast of the United States, arriving via freight from docks in South America. From these introductions it spread along the Gulf Coast from Florida to Texas, and later was also introduced into California via freight shipments arriving there from South America.